Waiting for the bus back to Havana in a Beatles cafe listening to welcome tunes of American music was really the first time I had felt a tinge of homesickness. Singing along to the familiar beats put a little spring in my tired and heavy steps. A wonderful adventure so far, equal parts scary, challenging and exciting. While I was not as taken with Trinidad as I was with Havana, I couldn’t help but feel that the respite was just what I had needed to clear my mind, and contemplate the the changes that are surely coming in my life. There had certainly been some excellent nuggets in which Trinidad served as a springboard. The impromptu trip to the sugar mills with my new South American friends, Stefanie and Mateo, and my version of a harrowing bike ride of 12 kilometers. (that may as well have been 1200) Thank god for Pina Coladas! Much like me, Cuba is full of contradictions; new and old, modern and stopped in time, breathtakingly beautiful, while dilapidated and decayed. I too am trying to find peace in a life that is odds with me. So the visit was poetic as well as polarizing. I have been curious about Cuba for a long time, but the pace at which my curiosity peaked was a slow burn as compared to how quickly I began soaking up the culture as I was there. The “Revolucion” is imprinted there in the same way as a fingerprint, solid and finite. The people are fiercely proud, wary of American infiltration again, but warm and welcoming all the same. 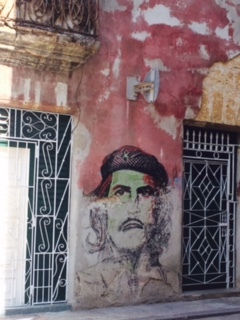 Cuba is a maze of colors, sights, and sounds, Murals, art, Afro-Cuban music, old cars and decaying buildings, all against a backdrop of rolling hills and the Caribbean Sea. The French colonial architecture pervades the landscape and is peppered with Cuban flags everywhere. The brilliance of the juxtaposition of this colorful tribute directly against the clear, present poverty and decay of the city of Havana in particular can be overwhelming, but also incredibly heartening. The people of Cuba are diverse and infectious. From the children playing “futbol” in the streets, to the old ladies smoking cigars in the afternoon, to the hustle of the merchants and bicycle taxis, idle time is for no one, all the while giving a feeling that life it to be savored and not rushed. So maybe that is the key to finding every day vacay bliss...savoring the moment, whatever calm or storm that may be. Time contemplated is never wasted if we learn to savor it. Just like that bike ride, there will be an end, and surely something sweet to indulge in when we come to it.